2. 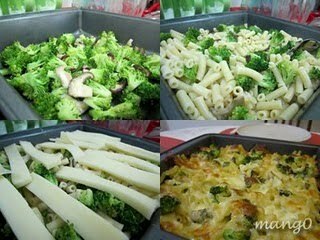 In a large frying pan, heat olive oil and fry broccoli and mushroom until half-cooked. Season with salt and pepper and transfer to deep baking try (I do not have casserole dish so I used baking tray). 3. Preheat oven to 180°C. 4. 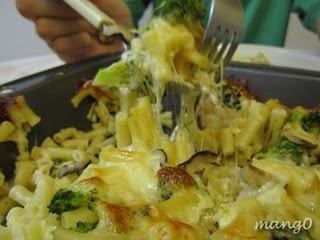 When macaroni is almost cooked, drain and add to fried broccoli and mushroom. Add the diced cheese. Sprinkle with a little more salt and pepper and gently mix together. 5. Cover with the sliced cheese and bake until cheese is melted and the top slightly browned, about 15 minutes.